Boston Red Sox third base coach Brian Butterfield works with the team during a spring training game against the Miami Marlins March 22 at Roger Dean Stadium in Jupiter, Florida. He also has been spending a lot of time with Travis Shaw, a first baseman by trade who is getting a lot of time at third base. But the 58-year-old Butterfield enjoys challenges. “This has been one of the most enjoyable spring trainings I’ve ever had,” said Butterfield, who gets to the ballpark in the wee hours of the morning ready to go to work, long before most of his players. “So far, so good. I’m proud of him. I’ve also gotten to know him, and he’s a solid guy,” said Butterfield, who noted that they have to be careful not to overwork Ramirez because of some minor back and hip issues. The Red Sox need a healthy Ramirez in the lineup. “He’s a middle-of-the-lineup kind of guy,” said Butterfield, who added that there is still work to do to get Ramirez more comfortable and instinctive at first. Shaw has made significant strides at third, according to Butterfield, a former University of Maine second baseman. “He’s got really good feet and a strong arm. He’s very athletic. And he’s a confident guy,” said Butterfield, who considers Shaw to be a top-notch first baseman. Pablo Sandoval had been the starting third baseman, but he is coming off a sub-par year, which prompted the Red Sox to give Shaw a lot of reps at third and opened up the battle for the position. Red Sox manager John Farrell announced on Thursday that Shaw would be the starting third baseman on opening day and that it was his defense that won him the job. Shaw went errorless in 49 chances during spring training, and Sandoval made four errors on 26 opportunities. Shaw credited Butterfield for his emergence at third base. “He is as good as it gets. He has helped me tremendously at third,” s aid Shaw in January at a hot stove banquet event at Husson University in Bangor. Multidimensional Brock Holt also can play third, although it appears as though Holt and newcomer Chris Young will platoon in left field. Shaw also has taken some fly balls in the outfield. 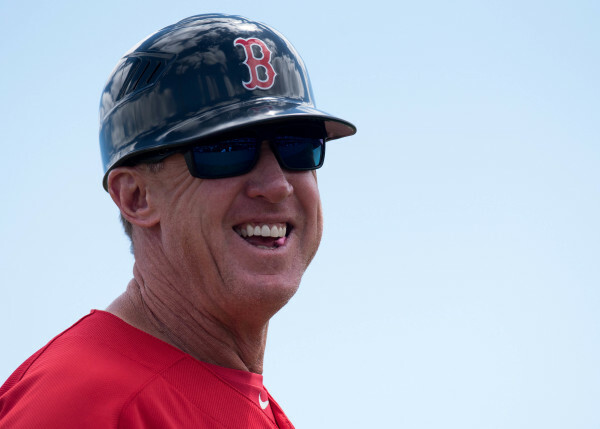 Butterfield also is the baserunning instructor with the Red Sox. Young, who played for the Yankees last season, has been a “nice addition,” according to Butterfield. “He’s an intelligent guy, and he’s a dangerous hitter, especially against lefties,” said Butterfield, who began his coaching career as a roving infield instructor with the Yankees in 1984. Young has had four seasons in which he has hit at least 20 home runs, and he hit 14 for the Yankees last season in just 318 at-bats. Butterfield said shortstop Xander Bogaerts continues to blossom and he has taken on more of a leadership role. Bogaerts made just 11 errors in 156 games a year ago after committing 20 in 143 games the previous year. He did play 44 of those 143 games at third in 2014. He also hit .320 last season, 80 points higher than he did in 2014. Veteran second baseman and leader Dustin Pedroia has had a “huge influence on Xander,” said Butterfield. The additions of ace left-hander David Price, a five-time all-star and the 2012 Cy Young Award winner, and quality relievers Craig Kimbrel and Carson Smith have improved the pitching staff, according to Butterfield. Kimbrel is a four-time all-star who has had at least 39 saves in each of the last five seasons. But Butterfield also warned that the Red Sox still have a “lot of question marks” and are coming off two last-place seasons in a division, the American League East, that contains a lot of good teams. Butterfield knows Showalter well as he worked under him with the Yankees and the Arizona Diamondbacks. Butterfield, who had off-season knee replacement surgery, has been a manager at the minor league level but doesn’t think managing at the major league level is an option any more. It doesn’t bother him. “That ship has sailed. But I’m very happy doing what I’m doing,” said Butterfield, who lives in Standish with wife, Jan, and is the grandfather of three. The Red Sox finished 78-84 a year ago, 15 games behind the AL East champion Blue Jays. In 2014, they wound up 71-91, which was 25 games adrift of division winner Baltimore. The Red Sox won the World Series in 2013, Butterfield’s first season with the club since coming over from Toronto with Farrell and bench coach Torey Lovullo. The Red Sox will open the season at 4:10 p.m. Monday, April 4, at Cleveland and will play their first home game at 2:05 p.m. Monday, April 11, against Baltimore.